You develop a wound when you sustain an injury to the skin. The wound heals in phases and is actually a rather dynamic process. Interestingly, the process is not linear because wounds can progress forwards and back through different phases and that usually depends upon a number of intrinsic and extrinsic factors at play. You will have to make use of different types of wound care products in order to deal with different types of wounds. You need different level of attention to treat an ulcer as compared to laceration. The healing process can be divided into four stages but each healing stage may be affected by factors such as management methods, tissue health, and efficiency of your immune system. 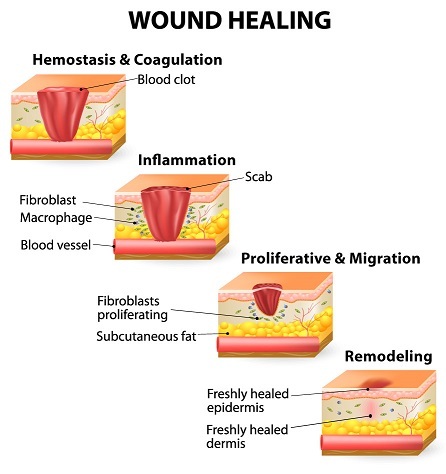 Here is more about the main stages of wound healing process. After you get injured, homeostasis begins in which your blood vessels constrict and the platelets create substances that help stop bleeding through clotting. Your body responds to trauma by raising level of inflammation. The blood vessels dilate after homeostasis is achieved. This allows white blood cells, nutrients, enzymes, antibodies, and other beneficial elements reach the affected area to accelerate wound healing. At this stage, you will experience the effects of inflammation, such as heat, pain, swelling, and redness. The second stage in the wound healing process is proliferation in which new, healthy granulation tissue replaces the wound. It is important that your blood vessels receive enough nutrients and oxygen to form granulation tissue. The tissue consists of a mixture of collagen and extracellular matrix, which helps develop a new network of blood vessels. During the process, the color of granulation tissue will change. If it is pink or red, it usually means that it is healthy. It indicates infection when the color of granulation tissue is rather dark. During this stage, your body will also work on damaged mesenchymal cells and change them into fibroblasts. They work more as bridges to ensure easy movement of cells around the affected area. These fibroblasts usually take three days to appear if your wound is healthy. They secrete collagen and liquids and give strength to the wound site. Your wound will continue to grow stronger through this stage. Maturation or remodeling is the end stage of the wound healing process. It takes place soon after your wound has closed up. This stage may continue for a couple of years and involves repair of the dermal tissues to improve their tensile strength. During this stage, functional fibroblasts will replace non-functional one and the number of blood vessels in the area will also decrease gradually. As the process continues for quite some time, it is important to stick to your treatment plan even when you notice the maturation has begun. If you leave the treatment too early, the wound may break down again because the area is up to 20% weaker even after maturation. How old you are will have a huge impact on how long it takes your wounds to heal. The major cell function required for proper healing diminishes with you becoming old. Your epidermis becomes thin and makes you more susceptible to injury. You may also develop chronic illnesses later in your life, making it difficult for your wounds to heal properly. Moreover, you need to be in an oxygen-rich environment to promote healing. In case you have a weak immune system or an ailment that has suppressed your immune system, it will become difficult for the cells to perform their job. People with diabetes or nerve damage usually have reduced skin sensation that leads to poor wound healing. Similarly, repeated trauma can make healing difficult. What medications you take will also have an impact on wound healing. Taking aspirin or another medication that inhibits platelet action or suppresses the immune system (like corticosteroids) can prolong healing. Undergoing cancer treatment will also affect healing because the treatments destroy cells and suppress the immune system. Not providing your body with enough dietary protein, iron, and vitamins may result in slow healing time. You may also notice poor healing if you are always under stress because it makes your brain to release hormones, chemicals, and other substances that hamper the wound healing process. Similarly, you will experience several complications if an infection develops. Infections can dramatically prolong different stages of wound healing. Moreover, your wound is more likely to take long to heal if it has affected underlying tissues as well.